With the successful launch of the SBA's International African Development Program, the SBA has signed on to manage and coach the Republic of the Gambia Men's and Women's National Teams. 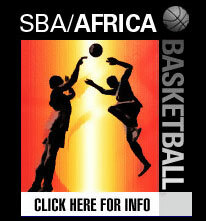 After a series of trips over to West Africa with the SBA All-Stars conducting clinics and playing exhibition games against the top players in The Gambia, the SBA has reached an agreement to further develop the sport of basketball in the Gambia with SBA coaches on the ground in Africa on a full-time basis. Within the past few months the SBA has spearheaded the renewed interest in the Sport of Basketball introducing the SBA All-stars to the region as well as committing resources and equipment in an effort to develop the youth in The Gambia through Basketball. Dr. Yahya A. J. J. Jammeh, President of the Republic of Gambia and members of The Gambia's Sports Ministry and President of the Gambian Basketball Federation have been impressed with the SBA organization and are excited about the recent agreement. The SBA has announced that Mike Richmond will coach the Gambian National Team which has been training under the experienced former professional player since the middle of February. The Gambian Team will play in its first meaningful competition in a forthcoming Basketball Tournament to be held in Guinea Bissau with eight other National teams from West Africa in the middle of April. "We are pleased with the athleticism and effort of the Gambian players and will cherish this opportunity of putting together and coaching the National Team. The excitement and interest surrounding the basketball team is tremendous. 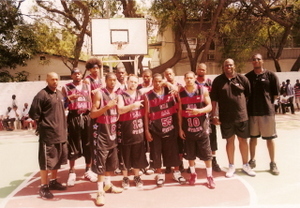 More importantly, basketball has helped to energize the country giving hope to the youth." One of the SBA's main missions with the SBA's International African Development Program is to "Develop the Youth Through Basketball."